Antioxidants in Higher Plants provides a unique blend of molecular and biochemical approaches to cover the state of the art in antioxidant function. The chemistry and protective potential of sulfhydryl and hydroxyl compounds are emphasized. Interesting perspectives are presented regarding the response of antioxidant metabolism to interactions among environmental pollutants, illumination, temperature, and water availability. The book also discusses how tools of molecular biology may further clarify antioxidant function and response to stress. 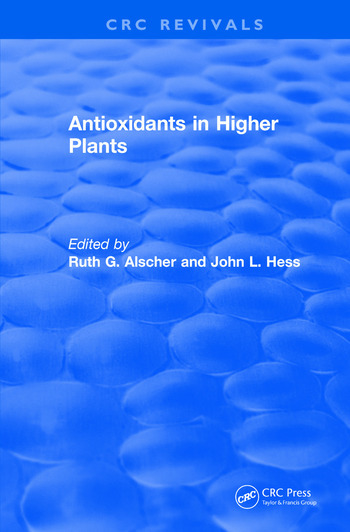 Antioxidants in Higher Plants will be an excellent reference for plant physiologists, biochemists, molecular biologists, ecologists, and students. Glutathione (A. Hausladen and R.G. Alscher). Ascorbic Acid (C.H. Foyer). Carotenoids (K.E. Pallet and R. Young). The Xanthophyll Cycle (B. Demmig-Adams and W.W. Adams III). Vitamin E,a-Tocopherol (J.L. Hess). Phenyl Propanoids (N.G. Lewis).